We are committed that the kids will learn the fundamentals in the 3s. Skiing, skating and swimming. 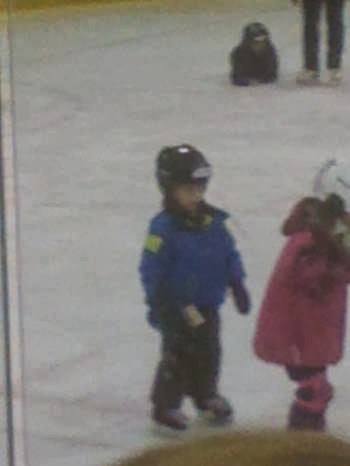 Fynn finished up his 6th and final skating lesson today. He has come along nicely and Vic who has been taking him, remarked that he is really getting the "glide/push off" piece. Yah, for Fynn moving the marble or making progress. A bit fuzzy, but here he is. Now ice skating is one thing we can do around here. I am terrible, but Erin has developed a love of it. She went for the first time a few weeks ago for a birthday party and was skating around like crazy.